Caprese salad, the Italian dish that layers fresh mozzarella with tomatoes and basil, is the quintessential summer dish. It is light, refreshing and delicious. These burrata bowl is an updated version of the dish that transforms the simple salad into its own meal. 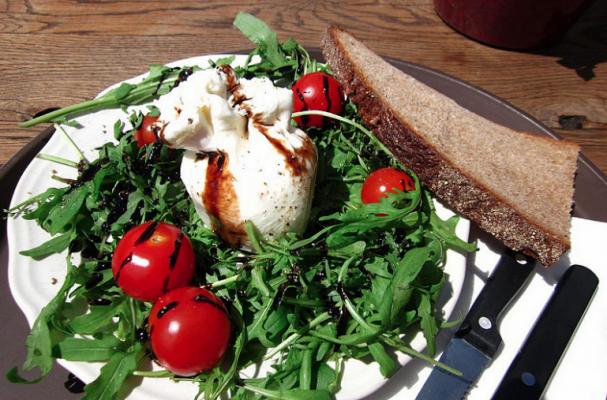 Burrata (which literally translates into "buttered") is a semi-soft cheese that is comprised of a mozzarella shell that is filled with a rich cream. This very special cheese is widely available and can be found in most grocery stores and Italian markets. It is the obvious star of these bowls and is complimented by salty olives, sweet tomatoes, spicy arugula and quinoa. Step 1: Cook quinoa according to package directions. Once cooked, fluff with a fork and set aside to cool. Step 2: Assemble the bowls. Place a 1/4 quinoa in the center of the bowl. Arrange the arugula, olives, tomatoes and basil around the quinoa. Place the ball of burrata in the center. Step 3: Season the bowl with salt and better and drizzle olive oil and vinegar.